So I did it! I got on a plane all by myself and took off to The Big Island! Most of my time in Hawaii has been spent on Oahu so it was really cool to see another island! The Big Island was a bit rainy and misty — but I flew into Hilo and rented a car….an hour or so later, I found myself at Hawai’i Volcanoes National Park. It was really cool to be there, and I arrived as soon as the visitor center opened. The chain of islands that make up Hawaii were all created by volcanoes, how awesome is it to actually know I was walking on one! 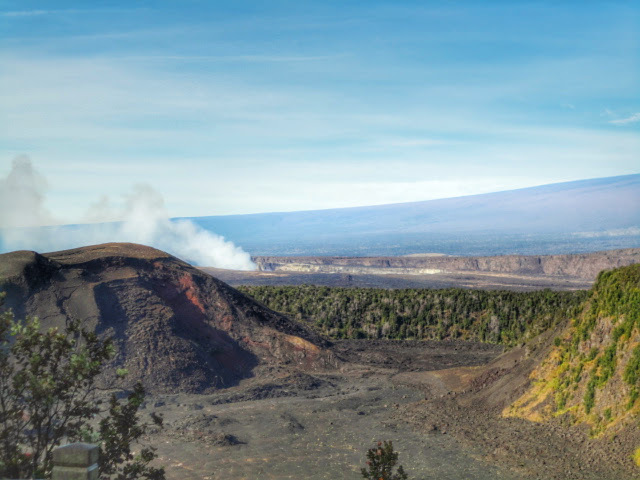 Kīlauea and Mauna Loa, two of the world’s most active volcanoes, are still adding to the island of Hawaiʻi and this park has shed light on over 70 million years of volcanism. My recommendation is to arrive EARLY. When I got there, it was a bit eerie, I felt like I was the only person for miles. It was a life changing experience to be there and see the steam rising from the steam vents, then seeing the craters in the distance. Some of the craters you can actually hike down and walk on (amazing). There were certain hikes that required you to “sign in” in case of any volcanic activity, the park needed to know who is out there and possibly unaccounted for. The coolest thing? getting to walk on dried lava all the way down to the ocean….and walking through the lava tunnels. These lava tunnels were formed during an eruption and they are so large you can actually walk through them and see the path they created. I will always consider this my first “big girl trip” arriving at 7am and staying until dusk. I was able to hike and experience to my hearts content. I will say this is a place I would LOVE to go back. There was just so much to see and capture, you can’t just do it all in one day. The sulfur in the air is very potent, and the steam rising from the natural vents around the island reminded me that I was actually walking on an active volcano. If you ever get the chance to make it to the big island, Hawai’i Volacones National Park is a MUST SEE.